We have done a lot of eating the past two weeks. As my husband said, we haven't eaten poorly, but nor have we eaten well. Well, actually we have eaten well, but not that healthily. Last night, as I reached over the Monte Bianco (really, wintery Eton Mess) I was spooning up to turn down the heat underneath Beef Bourgignon, I realized I hadn't had a single leafy green vegetable all day, or for that matter, a piece of fruit. Oh don't get me wrong, I enjoyed the jalapeno pancakes , bacon, and oj for brunch; the carrots I ate for a snack, but I am looking forward to getting back to my daily 5. We are lucky, here in San Francisco, to really have 4 seasons of growing, and produce. This season, the apples have been great, although the pears have not been as spectacular as last year. The last time I was at the Alemany Farmer's Market (2 weeks ago? ), the kiwis were just coming in to their own. 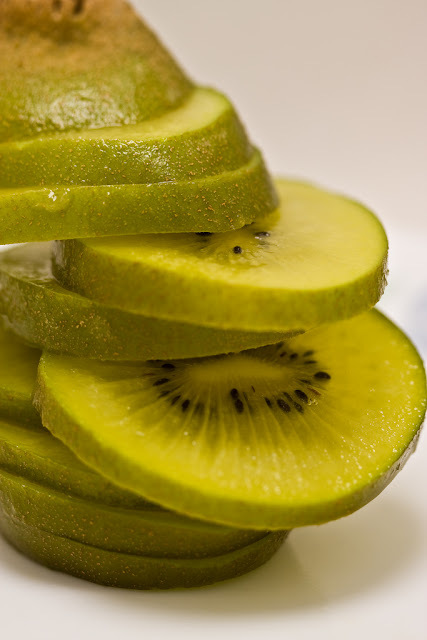 I've always liked kiwis alright, as say a component in deli fruit salad, or in a french fruit tart. Ok, so really: as decoration. But I think perhaps I've never had them ripe enough before last year. The Farmer/Vendor at our market says that when they are ripe enough, when they are ready, you can slice the bud end and push the fruit through. And for most of the weeks of kiwi season, this will be J's Saturday treat-- a sweet, jelly-like piece of fruit, appearing magically from brown fuzz. No knife even necessary if you just pull the bud off with your fingers. My antidope -y antidote from the antipodes.